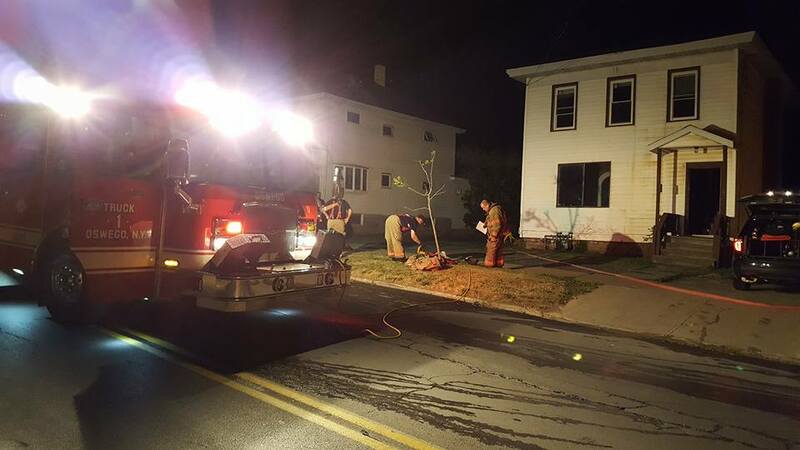 OSWEGO, NY – Oswego Fire Department personnel were dispatched to 166 West Utica Street for a reported structure fire at 2:34 am. today (July 28). Firefighters arrived on the scene at 2:38 a.m. and reported heavy smoke showing from the two-story multiple occupancy. While firefighters searched for the source of the flames and for any unaccounted for victims, they encountered zero visibility and high heat conditions. Firefighters reported finding heavy fire conditions in the rear of the basement, and worked to extinguish the flames and stop the fire from spreading. The fire was reported out at 3:04 a.m. and crews continued to ventilate and overhaul the structure. Residents of the two apartments reported that they were in bed at the time of the fire, and that they smelled smoke and were able to exit the structure. The four residents were able to escape thick, black smoke; one of whom exited a second story window to get out. An ambulance was called to the scene to evaluate a resident for smoke inhalation, who was treated and released at the scene. The cause of the fire remains under investigation, while the origin appears to be the rear of the basement. All of the residents have been displaced from the home at this time, and they are receiving assistance from the American Red Cross.